I recently paid a visit to Holly’s pad—I actually kind of crashed it! Holly is a very good friend of mine, has great style, two adorable kids, and she purchased a home around the same time I purchased my home. Holly and her husband Mike went to town on this house redoing all the trim, painting, and re-organizing the closets (this is another post for the future). Whenever I visit Holly, she always WOWS this WOM with fabulous crafts and quilts that her mom Pat has created and this visit was NO EXCEPTION! 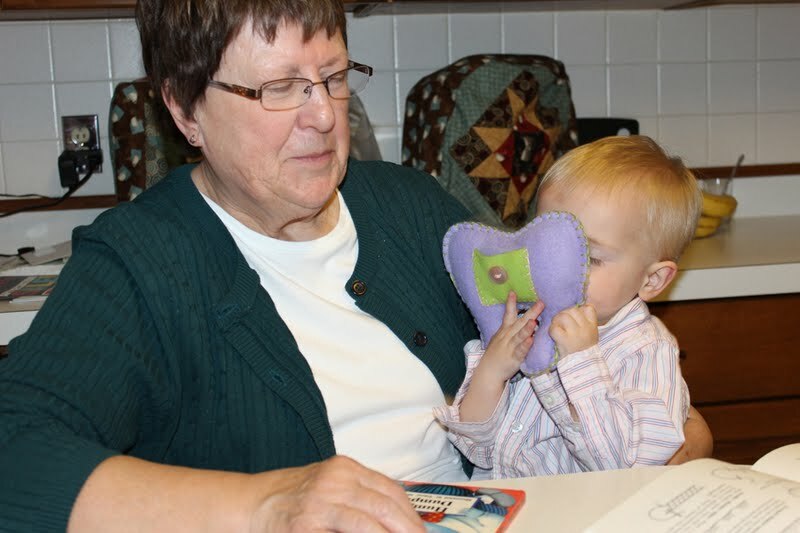 She had so many ideas and I took two to Williston and to Crafty G-Ma (Ethne and my hometown) for Memorial Day weekend. 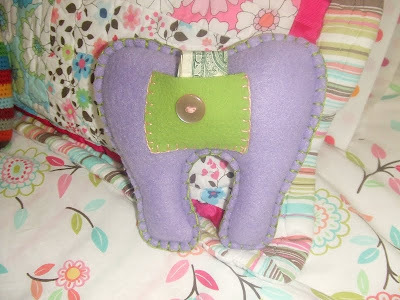 The first craft project I wanted to highlight was this adorable tooth fairy pillow. 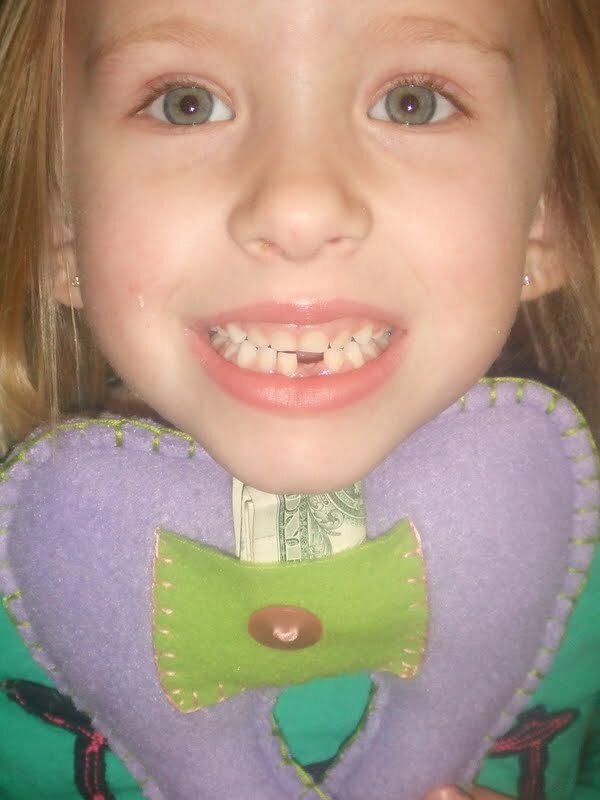 Holly's E--notice her missing tooth and money in her pillow? 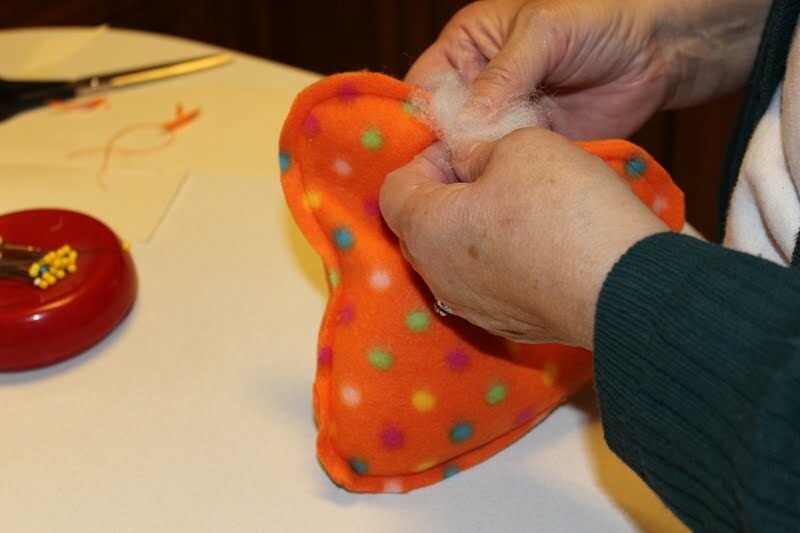 Mom and I quickly got going on this project and it was simple (better yet, it cost me nothing out of pocket because I crashed my mom’s fabric stash, button stash, and stuffing stash). First up, we traced the tooth to create our own pattern (I found it worked best to actually fold it in half so both sides would be equal). Cut out two (crafty G-Ma had leftover fleece that worked great). You will also want to cut out a coordinating pocket. 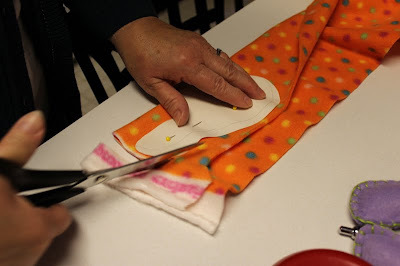 Next up, sew a ¼ inch seam along the edge (you are not going to be sewing this right sides together and flipping, because to give it the look you want the raw edge out). Make sure you leave a small area open so you can stuff the opening. Stuff the tooth until it is the perfect consistency…you can decide if you want it full or fluffy (we opted for in-between). Sew the gap. 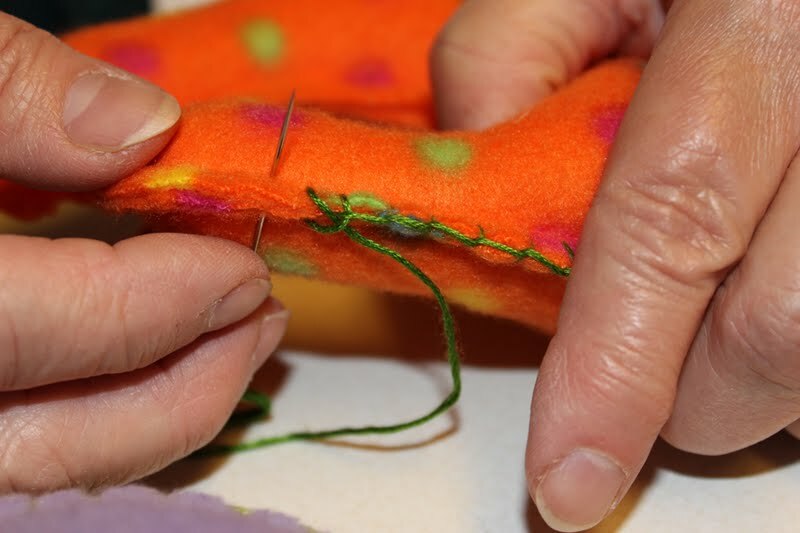 Next up, do a plain blanket stitch around the raw edge using embroidery thread (mom and I found that a full strand worked best, so don’t split the thread). To do the plain blanket stitch (according to Crafty G-Ma’s book, “Good Housekeeping New Complete Book of Needlecraft” published in 1971), do the following: "Work from left to right. Bring needle out on line (or very close to hem edge). 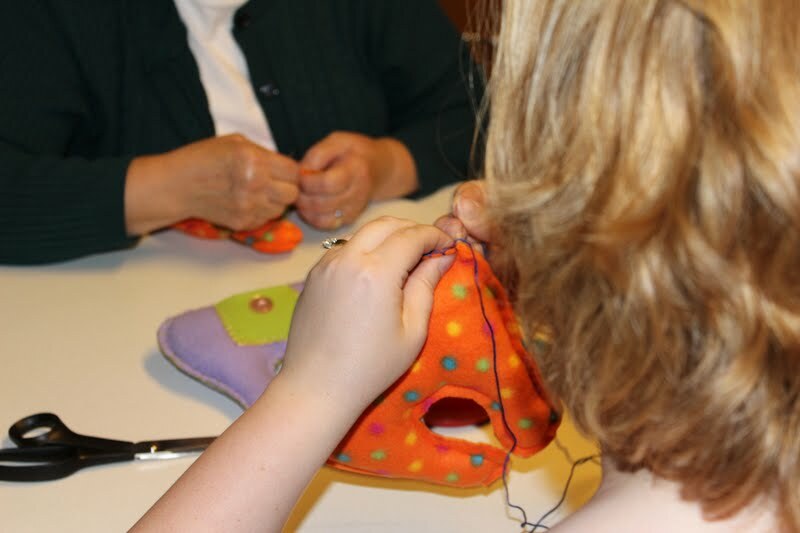 Take an upright stitch to the right with needle pointed down, keeping thread under the needle and come out on line or edge." 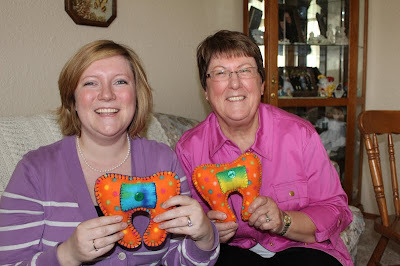 Mom (Crafty G-Ma) and I working on our pillows! Next, blanket stitch your pocket onto the front of the pillow. 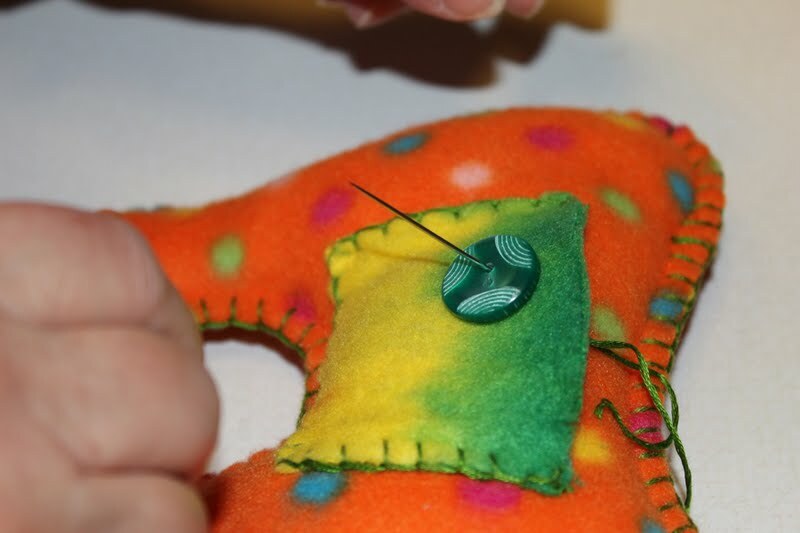 Last but not least, using embroidery thread, sew on your color coordinated button. Mur-Man of course turns 1.5 this weekend (we are planning a celebration), so he won’t be losing teeth anytime soon. However, this WOM is prepared. Coincidently, Mur-Man fell and chipped his front tooth this weekend. A quick check with the dentist determined to leave the tooth alone. 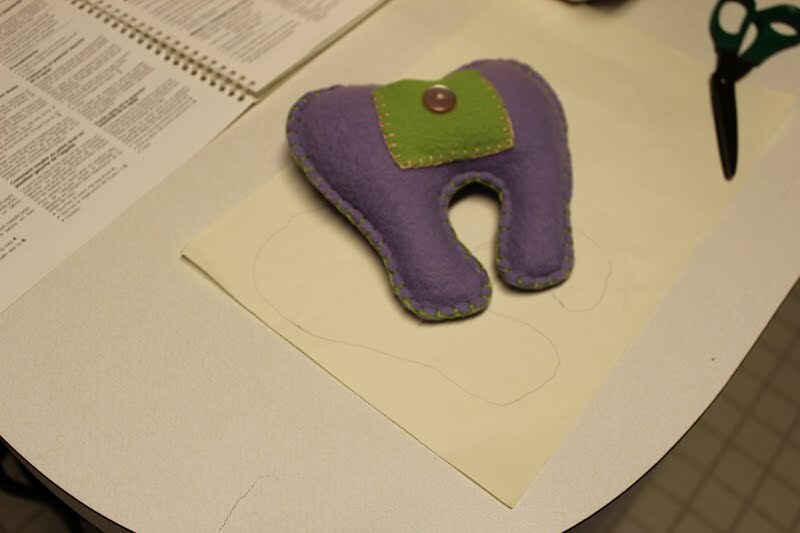 Poor Mur-Man, he will have a chipped tooth until the adult tooth takes over! (I assure you that the tooth fairy will leave full-compensation for this tooth though, and now the fairy has the perfect place to put the money!). SO PROUD--ONE CRAFT DOWN! MORE TO GO! Thanks Holly and Pat (Holly's mom) for the great idea! BRILLIANT! DOUBLE-HEADER FRIDAY: 25 CENTS SHOES LIKE NEW! WTF (WAY TOO FUN): FIRST FAIR RIDE! 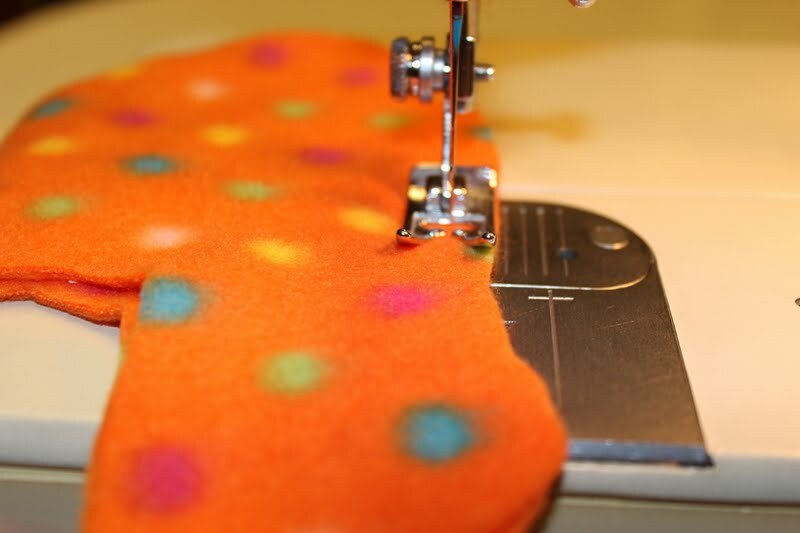 CRASH MY STASH: Sewing Machine Cover! TUESDAYS AT NOON: Lori on…THE DOUBLE CHIN! MOUTHWATERING MONDAY: Homemade Mac N' Cheese! DOUBLE-HEADER FRIDAY: RIOT GIRLS: PRANKS! DOUBLE-HEADER FRIDAY: SURPRISE STREET SALES! TEA LESSON PART THREE: AFRICAN TEA! Yeah! Baby K is here! CRASH MY STASH: Reusable Coffee Sleeve! DOUBLE-HEADER FRIDAY - MISSION: GARDEN! TEA LESSON PART TWO: Sun Tea! WTF (WAY TOO FUNNY): Wii Family Fun! DESIGNER KIDS CLOTHES ON A DIME! CRASH MY STASH: Pillow Pals! WTF (WAY TO FUN): FOLLOWER REUNION! TUESDAYS AT NOON: Ethne on...the BOMBSHELL! MOUTHWATERING MONDAY: DAD & CONNIE'S BEANS! LEAP DAY: EATING OUT BAN! DOUBLEHEADER FRIDAY: DECK MY DECK!